Liberia Ebola death first since being declared free of virus. 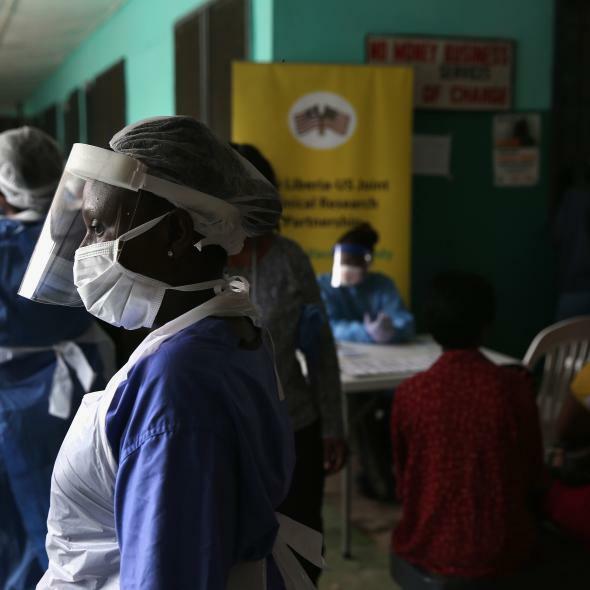 Health workers in protective clothing await patients on Feb. 2, 2015 in Monrovia, Liberia. A 15-year-old boy in Liberia died of Ebola on Monday, according to health officials, marking the first case of the virus since the country was declared free of the disease in September. The death was also the first Ebola fatality since July. The unfortunate news comes as the country announced an ominous “fourth wave of the Ebola Virus” last week. That is dispiriting news in Liberia, the heart of the outbreak over the last two years, where more than 4,800 people have died from the more than 10,600 recorded cases of the virus. “The boy’s father and brother also have tested positive for Ebola and have been taken to an Ebola treatment center along with his mother and two other siblings,” the Associated Press reports. “Health officials have identified nearly 160 people who might be at risk of being infected with the disease, including eight health-care workers ‘who are at high risk because they came in direct contact with the boy,’” a health ministry official told the AP. Liberia was first declared Ebola-free on May 9, only to record two deaths from the virus the following month. The WHO again declared the country rid of the virus on Sept. 3, which held until last week’s diagnosis. “Our working hypothesis is that the virus is reintroduced into the human population through uninfected people and we know that it is a possibility that people who have been infected with the virus previously may continue to transmit,” Dr. Alex Gasasira, the WHO’s Liberia country representative, told Reuters.